I modeled at the Galaxie on a Saturday again... it was a bit hot and stuffy in the drawing studio but the moderator and the staff were nice enough to get me a fan so I wasn't completely drenched in sweat. One artist was working digitally- he had an Apple Macintosh laptop with a drawing pad connected to it. He mentioned that the calibration was not always dead on so he had to ignore where his stylus was and just pay attention to the pointer on his screen. It was fascinating to see him work and look at his resulting drawings. 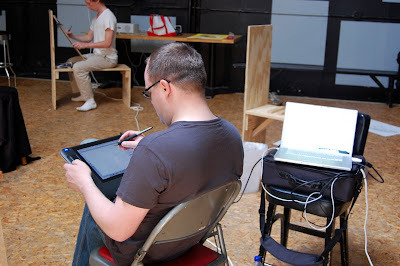 This was the first I had seen anyone working digitally during a drawing session. Pictured above you can see an artist working digitally. People work in many different mediums- it's all just different avenues in the process of creation. See you at the next drawing session...! i am supposed to get an e-mail to alert me to new posts; somehow that did not happen and by chance i happened to come upon your comment. yes, indeed , from the photos i have seen, you appear to be good at your job as model - to my taste, though, a bit heavy on the athletic aspect....then again, i am older and am more inclined to show the way we (and our bodies) age. and i really enjoy the opportunity to show that an ageing body belies the misconception that sexuality is the sole realm of the young. so what do you think of the sexual aspect of modeling?